You'll wear the same wedding ring every day, for the rest of your life. Choose a design that you instantly love, and if you can't find one that suits you just right - create it! Wedding rings are the most special jewellery you'll ever buy. 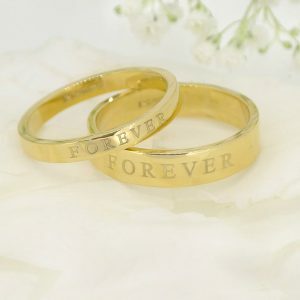 These symbolic rings representing your love and ever-lasting commitment are worn everyday and are likely to be some of your most treasured possessions. When you first start looking at wedding ring options, the choice can feel overwhelming. There are so many different designs, styles and finishes- and they seem to come in endless widths, so how can you be sure that the ones you like are the ones that will suit you? 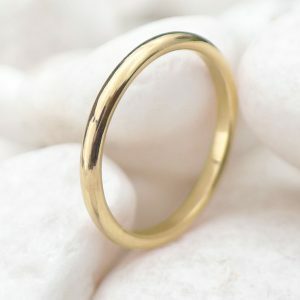 In my wedding ring guide, I'll explain the different styles of wedding rings, finishes and what they mean. 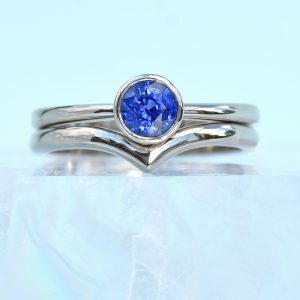 Once you understand the differences and know what you want, can either shop my existing wedding ring designs or contact me with your ideas to create a bespoke set or single matching ring. 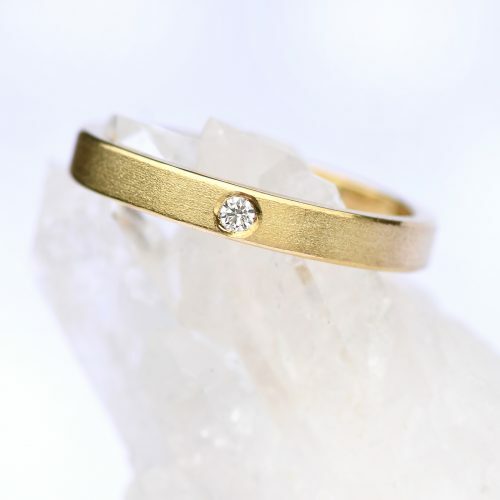 Wedding rings feature a measurement in millimetres to explain how wide the band is. This is an indication as to how much room it takes up on your finger and is a great place to start when choosing your wedding rings. Use a ruler against your ring finger to see how wide and tall the ring will look on your finger. We all have different ring sizes and finger lengths, so something that might look quite dainty on one person could look larger on another. 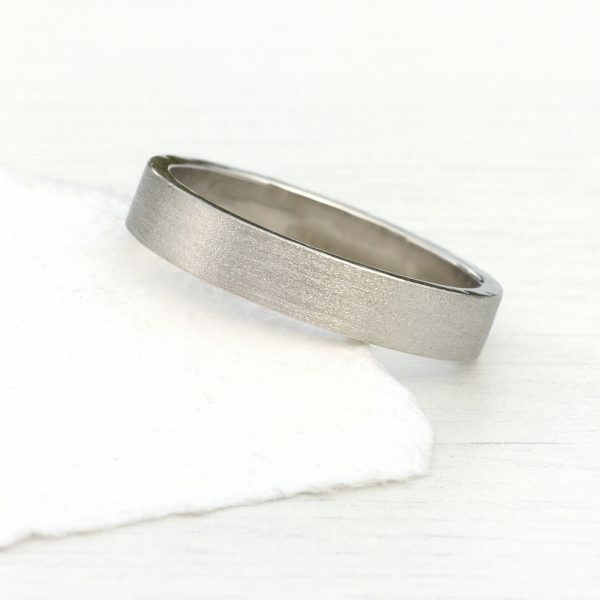 My smallest wedding rings are my ring spacers which measure just 1.2mm in diameter. 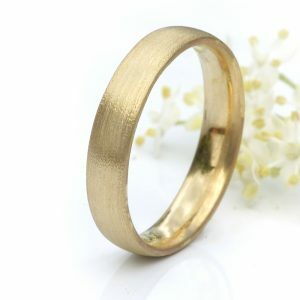 My widest rings measure 7mm (or wider on request), so there is a big difference between the slimmest and the thickest. 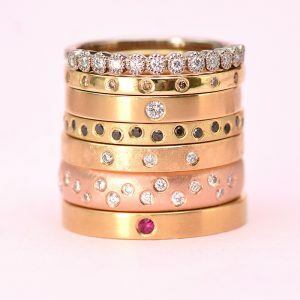 To make it easy to find rings in the right size range, you can shop by slim, medium and wide styles. Wedding rings come with a range of band styles. The below gallery explains what the design names mean and what the key features are. 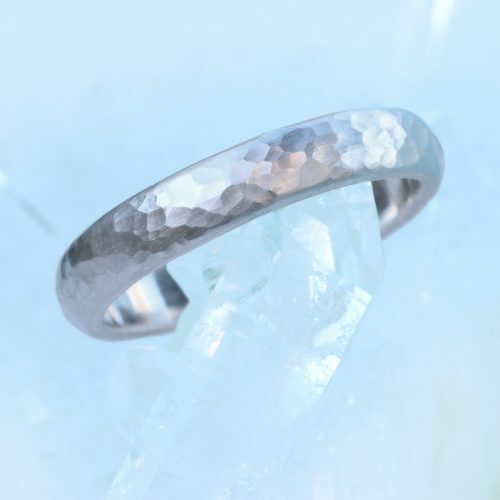 These rings have a rounded top but are flat inside the band, giving the band a 'D' shape in profile. They are comfortable to wear and will suit most engagement rings. 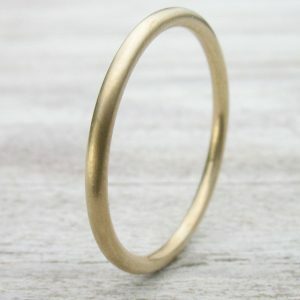 Flat wedding rings feature a flattened inner and outer surface, giving them a lower profile than round wedding rings - offering a less noticeable feel than round rings. I smooth the edges to make them comfortable. 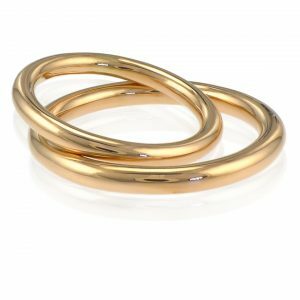 Comfort rings are similar to half-round, but they feature a rounded curve to the outside face and a concave curve inside the band, like an oval. 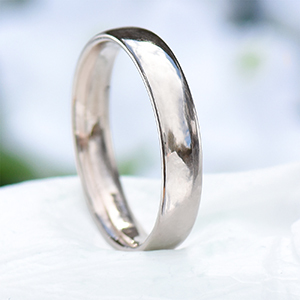 They're our best-selling wedding ring design as you hardly feel you're wearing the ring. 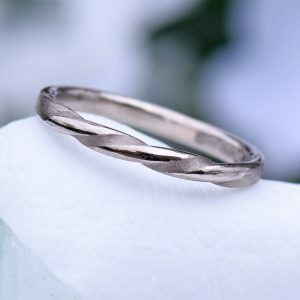 These unique wedding rings feature a single or multiple twists in the metal. 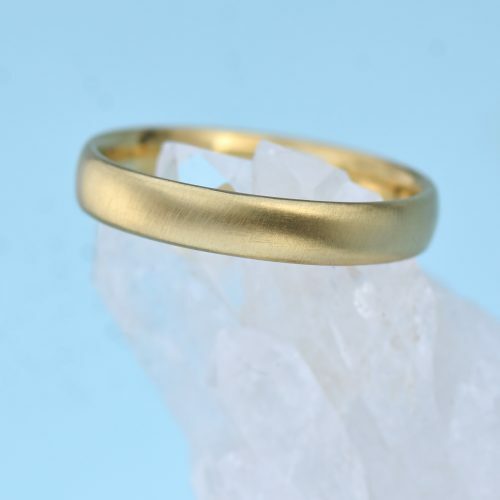 They make more of a statement while retaining classic style, making them a popular alternative wedding ring choice. Adding a diamond or single statement gemstone to a wedding ring can make it look that little bit more special. 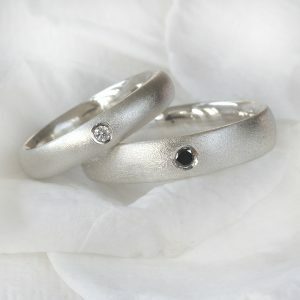 Black and blue diamonds are increasingly popular choices. 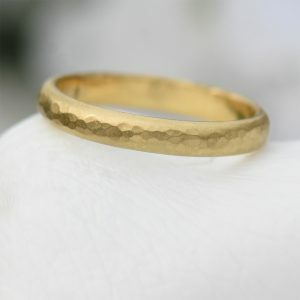 A continuous circle of rounded gold, usually in a thin band width. These rings look similar to an angel's halo and they're the perfect choice for wearing with larger engagement rings. 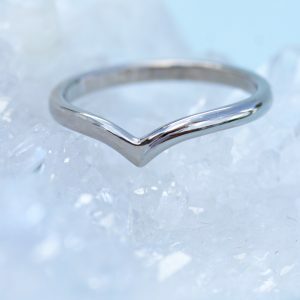 Features a dip in the band height, with a pointed chevron. These rings are a good choice if you need a little space to accommodate an engagement ring and are also sold in bridal ring sets. Square profile rings aren't actually square as such! The flattened sides of the ring are simply all the same width. 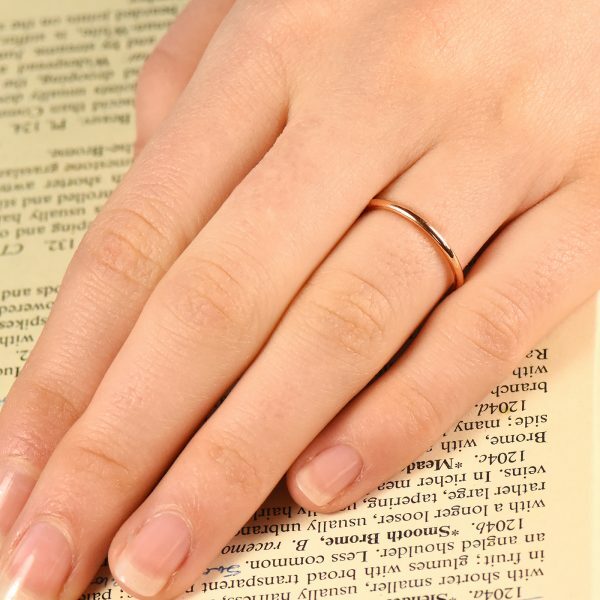 Square rings sit flatter against your finger and are great for stacking. Shiny or matte? Textured or smooth? 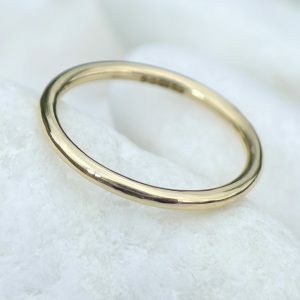 The below guide explains what the different wedding ring metal finishes are. They can be applied to Sterling silver, 18ct gold, rose gold, white gold and platinum. 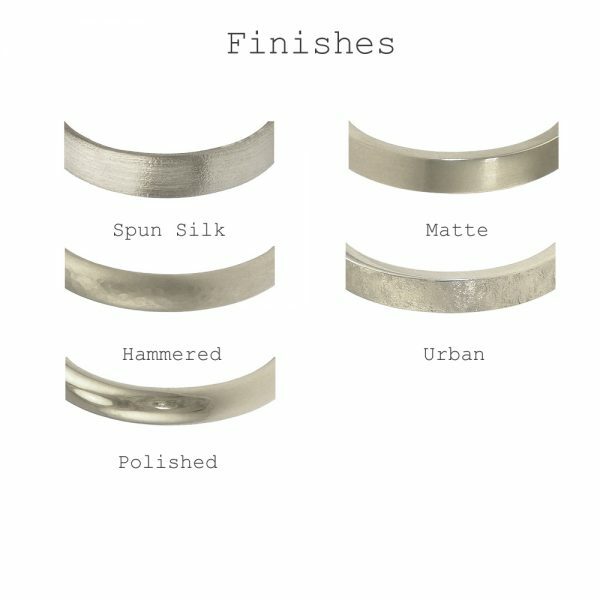 You can choose any of these finishes for your wedding ring using our custom wedding ring design service. Tiny indentations are applied to the outer metal using a specialised jewellery hammer. The effect causes light to reflect off of the band similarly to a cut gem. A matte or polished finish can then be applied to the texture for added effect! A lightly textured wedding finish, with the appearance of individual threads of silk that follow the direction of the ring curve. A slightly matte finish that feels pleasing to the touch. A contemporary finish, that represents urban life. 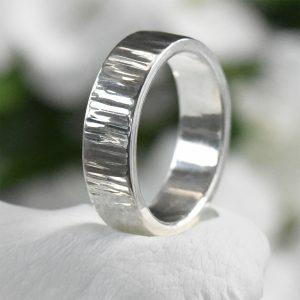 This hand-applied finish has a polished look with a little more grit and works best for wider wedding bands. 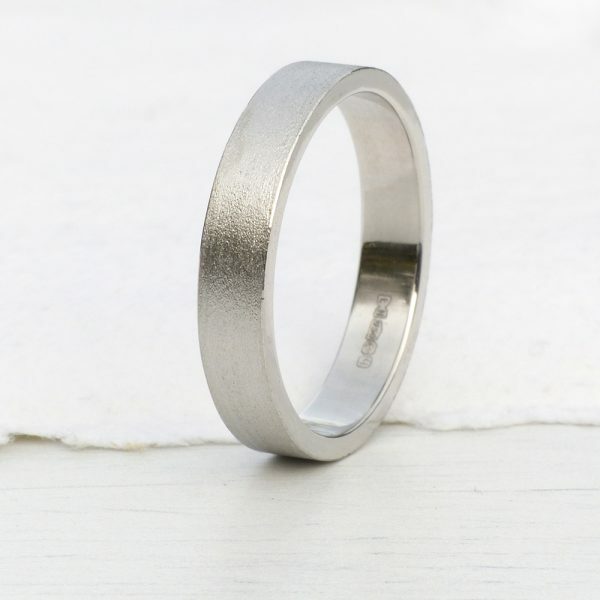 This classic finish is the one most commonly chosen for traditional wedding rings. 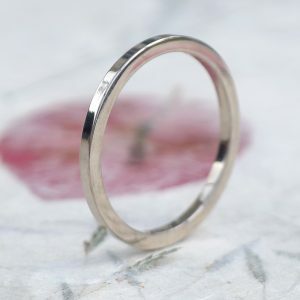 Polished wedding rings are buffed to a mirror-like reflective shine. 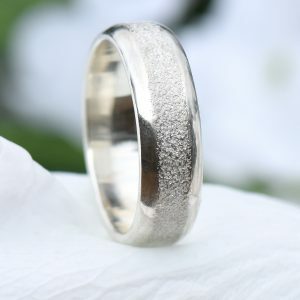 The frosted wedding ring finish has a detailed finish that looks similar to frosted glass. The finish creates an eye-catching reflection in the metal that contrasts the slightly matte texture. The concrete finish captures the essence of an inner city, urban lifestyle. These rings appear to have been rolled through concrete, with an intricate texture that feels almost gritty. A meticulously hand detailed finish with wood grain grooves that create the look of tree bark. This unusual texture is the perfect choice for fans of nature and the great outdoors. 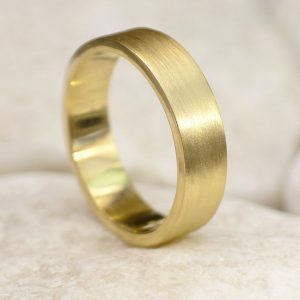 A matte finish makes a traditional wedding ring look that much more rustic. 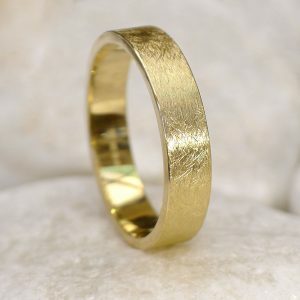 Matte wedding rings have a slightly surreal look to the gold, with a dulled reflection that highlights the shape of the band. When it comes to wearing multiple rings on one finger, there are a few band styles you can choose. A bridal ring set features an engagement ring with a specially-shaped wedding band. They're designed to fit snugly together, making them the perfect choice if you're yet to choose a forever engagement ring. 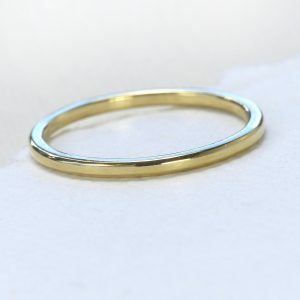 These slim, plain rings are worn in between wedding rings, engagement rings and eternity rings. 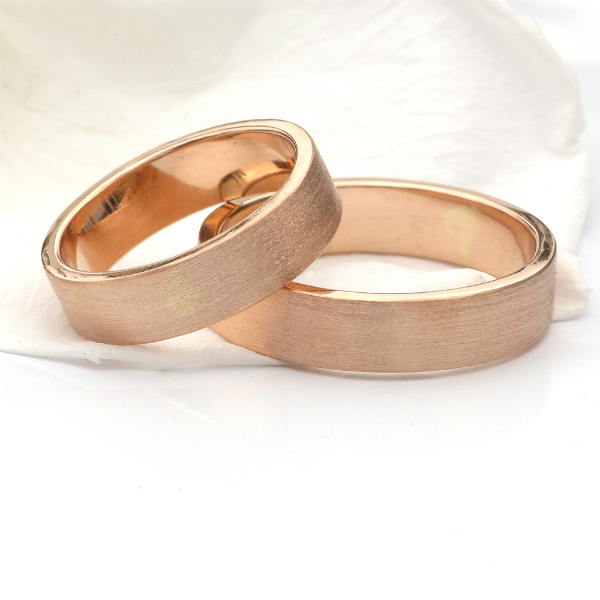 Just like regular wedding rings, they come in a variety of widths and are usually flat or rounded in profile. These bejewelled bands are often worn alongside wedding and engagement rings as a sign of eternal commitment. They can be gifted as an anniversary gift, or worn instead of a plain wedding ring. 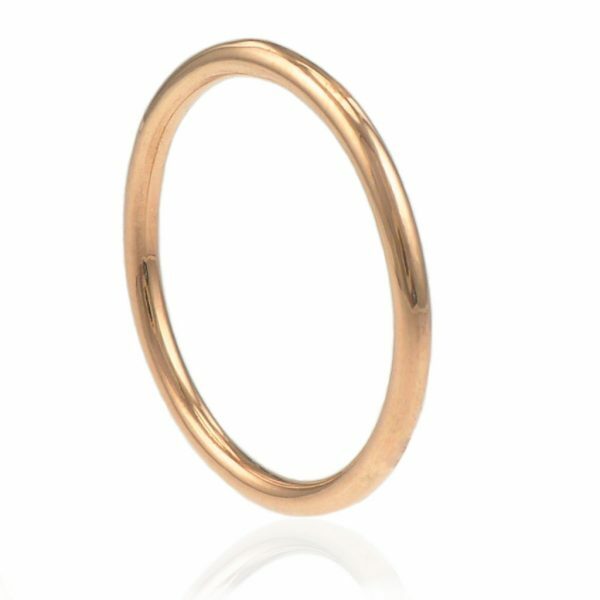 Creating a matching set of wedding rings or creating a single unique wedding band with Lilia Nash. She'll guide you through the design process, with every attention paid to the unique design choices you and your partner want. 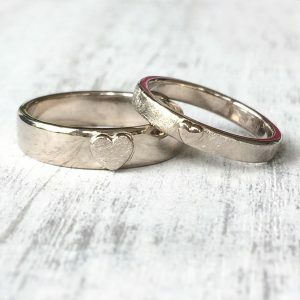 Lilia's custom made wedding rings take between 6-8 weeks to create before being dispatched for free via insured delivery, anywhere in the world. Order bespoke wedding rings in 18ct gold, white gold, rose gold or platinum with your choice of width, finish and additional design details like diamonds or decals. 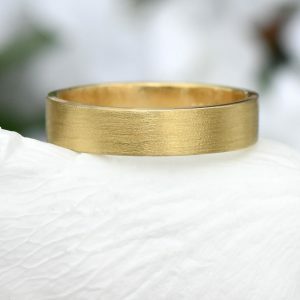 Your rings can be made in any UK, EU or US ring size, including half and quarter sizes.